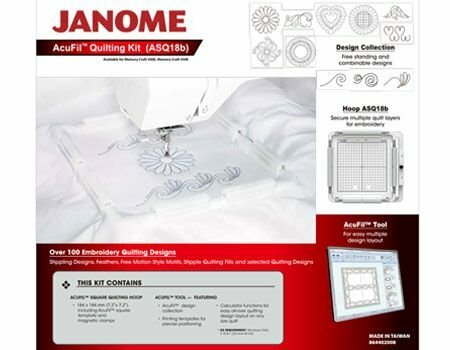 The Janome Acufil Quilt Kit ASQ18b for Memory Craft 400e 500e has many great features to add to your Janome 400e, 450e, 500e. 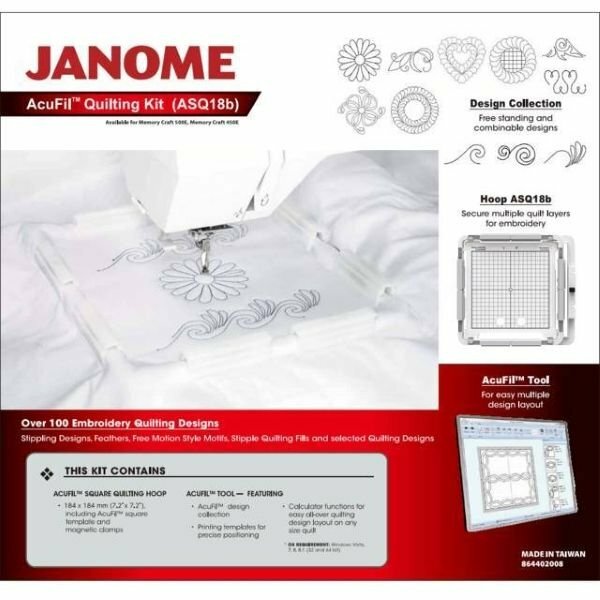 The Janome Acufil Quilt Kit ASQ18b for Memory Craft 400e 500e, enables you to turn your Janome MC400e, 450e or MC500e embroidery machine into a long arm quilter! This amazing Kit has been introduced especially for all existing customers. This Kit allows you to perfectly stipple your quilts or quilting projects giving you that professional quilted finish. Get the professional finish by simply pressing the button and letting your Memory Craft do all the work for you. – ASQ18b Hoop – Magnetic clamp hoop 184mm x 184mm OR 7.2 inches square. Great for securing multiple quilt layers for embroidery. – Janome AcuFil™ Quilting Tool Software: includes a special quilt calculator, which allows you to quickly design your quilt layout for any sized quilt. Choose from 97 built-in embroidery quilting designs, including stippling designs, feathers, free motion motifs, stippling quilting fills. – Janome AcuFil™ Design Collection with 91 embroidery quilting designs: stippling Designs; Feathers; Free motion style motifs; &amp Stipple Quilting fills.